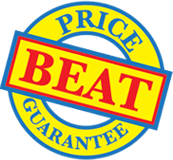 Brass binding screws and nickel binding screws backed by our Price Beat Guarantee. Create the very best impression for your brochures, catalogues and promotional material when a high perceived value is a must. The barrel diameter of 5 mm fits standard punched holes. Nickel binding screws in sizes 3mm up to 25mm are made of solid brass that has been nickel plated for that silver dipped finish. Mini-packs of eight screws can be purchased to test for your intended application. Use for restaurant menus, albums, corporate brochures, swatches, hotel guides, point of sale applications and much more. The screw heads are the preferred dome shape and feature a knurled edge for improved grip. The sizes from 3mm to 90mm equal the barrel length in mm between the two screw heads. Sizes 70mm up to 90mm incorporate a barrel and two screw heads. 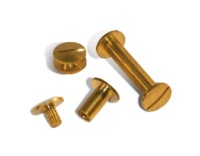 If you then want to buy a different type of brass binding screws after you've added one to your basket, simply click on the reset button and select your new options. If you don't want to use the 'easy ordering' product selector panel, you can simply buy from the list of brass binding screws below.